With the vast array of choices available to you when deciding to go with metal tiles, you may find that it can be quite challenging to narrow down these choices to the one that fits your aesthetic. Aside from the selection of materials and patterns, there are also several different colors and finishes to choose from including those with a metallic finish or those painted with a simple, solid color. We are here to offer some insight into how you can use either one of these choices. Metal tiles with a metallic finish can be complementary to the other finishes in your home. For example, you may have a granite countertop in your kitchen that contains small specks of silver. In this case, you can use metallic finished tiles as your backsplash, and they can pick up those more modest and more intricate details in the counter. If you have stainless steel appliances and other like finishes in your home, you can also use metallic tiles as a way to add a bit of character by using a variety of different material combinations; each one complimenting the next. On the other hand, solid tile colors are also a good choice and can offer subtle movement to your décor. While metallic tiles are often used to stand out and create a focal point for the space, the solid tiles can be used to tie in the other colors and aesthetic of the space without detracting from the other elements. For example, if you have earthy or muted wall colors and a shiny, almost metallic look to your countertops, the solid metal tiles as a backsplash can create a contrast between the different finishes and add a touch of style and color to the space. 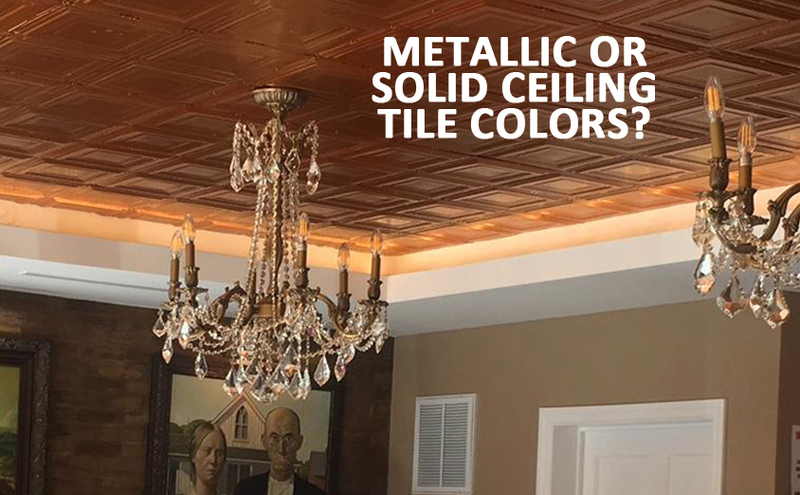 Using metallic ceiling tile colors in the home is an effective and straightforward way to make certain areas sparkle and pop. From stainless finishes and gunmetal to copper and bronze finishes, these metallic finished tiles will look amazing. However, never underestimate the power of solid ceiling tile colors to tie an entire room’s design together seamlessly.